The youth remain the most vulnerable group within the labour market with the unemployment rate among those aged between 15 and 34 at approximately 38% implying that more than one in every three young people in the labour force do not have a job. Young people have become discouraged with the labour market and are not building on their skills base through education and training. More needs to be done to safeguard the future of young people. There is a need for everyone (social partners and civil society), specifically the youth, to play an active role in engendering a new consciousness of unity and solidarity to build a better South Africa. 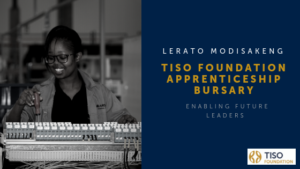 Programmes geared at providing a viable training stream for thousands of black youth, who otherwise would have little chance of tertiary education and would face the cruel prospect of unemployment is the Tiso Foundation Apprenticeship Bursary. Established to offer artisanal training and development to disadvantaged, but talented young people, and prepare them for jobs critically required in our growing economy. 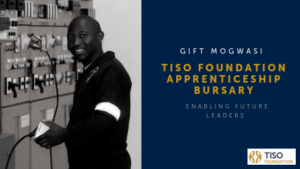 The Tiso Foundation has been partnering with the Artisan Training Institute (ATI) since the inception of its Programme. ATI provides high quality technical training for electricians, diesel mechanics, boilermakers, millwrights and other technical trades, not only providing theoretical knowledge but offering students hands on experience. ATI, is accredited with the Mine Qualifications Authority (MQA) and the Manufacturing, Engineering and Related Services Sector (MERSETA). The Foundation identifies and supports learners who demonstrate determination, ability and the passion to make a difference in disadvantaged communities. Beneficiaries of the programme are black youth between the ages of 18 and 34 years and are selected through a rigorous selection process. They are directed into the training programme best suited to their aptitude and capabilities. Since inception the Foundation has entered into a matched funding partnership with the Aveng Group CSI Trust, and in 2013 a matched funding partnership with Bell Equipment. These companies not only provide financial support but have also offer apprenticeships to trained learners, but also provide post trade test qualification training and permanent employment. Following completion of the course, the learner is placed in an 18-month apprenticeship with a relevant and reputable company, where they can sharpen their skills, prepare for the trade tests and receive valuable work experience. After completion of their trade test, they become fully certified and qualified artisans. Tiso Foundation in partnership with ATI have since 2009 trained over 300 learners. It is beneficiaries such as Gift Mogwasi, and Lerato Modisakeng who demonstrate the value of investing in education and providing scarce and critical skills to youth within our country. Gift Mogwasi grew up in a community without electricity. After losing both parents at a young age he grew up with his aunt and later went to live with his grandmother in a village. He failed grade ten twice, with no access to any electrical appliances and struggling to study and complete school by candle light he never gave up and passed matric. On completion of his schooling he moved back to Johannesburg and tried to start studying but soon realised that he could not afford the fees at any college, so he was forced to find a job. He never gave up on his dream and with his aunts unwavering support he realised his dream when he was contacted by ATI telling him he had a bursary to complete his studies and training. Both Gift and Lerato have continued their pursuit and a vision to give all communities access to electricity and improve the conditions within in their communities. Today Gift and Lerato have successfully completed the training programme and passed their trade tests. Lerato now works for Bombardier Transportation South Africa as an electrical assembler and Gift has recently been offered a full-time position as a technician at the Randfontein Municipality. Gift is especially interested in renewable and sustainable electricity for disadvantaged communities. By investing in talented youth and providing them with an opportunity to realise their full potential, they not only providing much needed skills in the South African economy, but they are making a difference to their own communities. “It is important for us to share the stories of our beneficiaries, to help inspire other youth in the country. There are many opportunities available to develop themselves further and change their lives and circumstances toward a more positive trajectory,” says Bridget Shibambu the General Manager of Programmes at the Tiso Foundation.